The Rev. 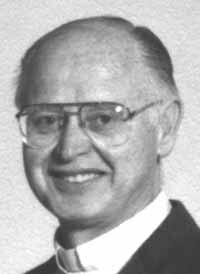 Dr. Manfred H. Berndt, 75, passed away on Oct. 15, 2010. He was born on Aug. 27, 1935. Manfred was the sixth of 10 children born to Charlotte Zimmermann and the Rev. Markus Berndt in Eau Claire, Wis. They were Lutheran missionaries serving in Argentina, and Manfred was born on their furlough to the U.S. Manfred spent the first years of his life in Argentina until the family moved to Wisconsin when he was 13. He was known as "Pastor" to most and as "Opa" to his family. Manfred was born to serve the Lord. He went to seminary to become a pastor and in his last year he met the love of his life, a cute little German girl named Jutta Struckmeyer. They married on June 17, 1961, and moved to Hong Kong where he was president of the Hong Kong Seminary and he and Jutta raised four children. He received his doctorate in theology in 1970. In 1977 the family moved to Pocatello, Idaho, where Manfred was challenged to bring life to Grace Lutheran Church. While at Grace, the church went from a membership of less than 100 in a small church to almost 1,000 and the building of a new church to house the growing membership. After 23 years of service at Grace, Manfred retired from full-time work to Hailey, Idaho, but could not give up his love of working with the church. He became a part-time pastor at Valley of Peace Lutheran Church in Hailey until his retirement in 2006. One of his greatest passions was sharing his love for his wife and his Lord through Marriage Encounter ministries. For 32 years, they led Marriage Encounter Weekends until their retirement just a few weeks ago. He was preceded in death by his parents; his brother, the Rev. Herbert Berndt; and his sister, Dr. Erna Kelley. He is survived by his loving wife, Jutta; his two daughters, Margarete (Harold) Dohring and Dori (Eric) Madsen; his two sons, Chard (Carrie) Berndt and Michael Berndt; and his 10 grandchildren, Sarah, Joshua, Matthew and Luke Dohring, Emma and Paige Madsen, and Brittany, Eli, Isaiah and Brandon Berndt; and his siblings, the Rev. Hans Berndt, Margarita Berndt, Martin (Heidi) Berndt, the Rev. Leander (Joyce) Berndt, Dr. Theodore (Nancy) Berndt, Dorothy (Bill) Fletcher and Dr. Ernst (Joan) Berndt; and many, many nieces and nephews. We will miss you, Opa, but we know you are with the Lord in eternal glory! A memorial service will be held at Grace Lutheran Church presided by Pastor Jonathan Dinger, 1350 Baldy Ave., Pocatello, Idaho, on Oct. 23 at 3 p.m. A second memorial service will be held at Valley of Peace Lutheran Church at a later date. In lieu of flowers, the family would prefer that donations be made to one of the following charities: Mt. Olive Lutheran Daycare and School (206 E. Wyandotte Ave., Shelton, WA 98584) where his daughter Margarete is director; Southern Idaho Learning Center (www.sidlc.org) where his daughter Dori is executive director; or Camp Perkins Lutheran Outdoor Ministries (www.campperkins.org). Friends and family may share their thoughts and memories and view some photo memories at www.woodriverchapel.com.